Figure 1. 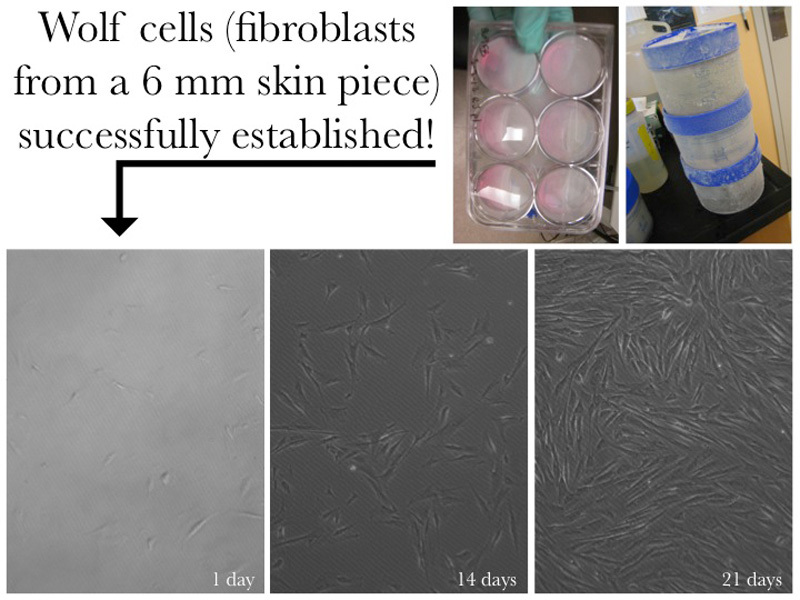 Growing wolf cells in the laboratory from a field biopsy of a Yellowstone wolf. These cultured cell lines will be used to measure gene expression differences between black and gray wolves and to test hypotheses about how coat color is linked to immune function. We are studying the role of a gene, canine beta-defensin 103 (CBD103), which has been found to have a mutation that causes black coat color in Yellowstone wolves. Our collaborator Tim Coulson found evidence that black wolves carrying two copies of this mutation have over 50 times lower lifetime reproductive success than wolves that completely lack (gray coat) or have one copy (black coat) of the mutation. We don't know why wolves carrying two copies of this mutation have such low survival, but we hypothesize that the mutation compromises the animal's immune system. To test this hypothesis, we have developed cell lines from six North American gray wolves from Yellowstone National Park. By developing cell lines from both black and gray wolves, we can use bacterial and viral components to stimulate the immune system of the cells and compare the immune responses of wolf cells that either carry or lack the CBD103 mutation. We can then measure expression of various immune genes to identify which immune pathways the CBD103 mutation is affecting. Results from this research will be valuable in understanding why reproductive success between black and gray wolves differs so dramatically.